Homemade puppets break the boredom of a rainy day, but can also serve as a creative exercise in dramatic play or a clever retelling of classic stories. Children naturally take to them as a way of expressing themselves, not only in giving their puppets personalities but in decorating and designing them. Puppets have been popular for thousands of years, dating back to the ancient Greeks and Chinese, where they were used in dramas, comedies and religious ceremonies. There are many types of puppets, including hand puppets, finger puppets, glove puppets, flat puppets, rod puppets and shadow puppets. Some may have bodies, but all have faces. Active puppets are those with mouths or body parts that can move and replicate emotion. Static puppets have unchanging expressions, relying on the puppeteer's voice to bring them to life. Homemade puppets can be made from many household items, or standard objects found in a child's art drawer, including construction paper, pipe cleaners and markers. Other items can be picked up cheaply at local craft stores. 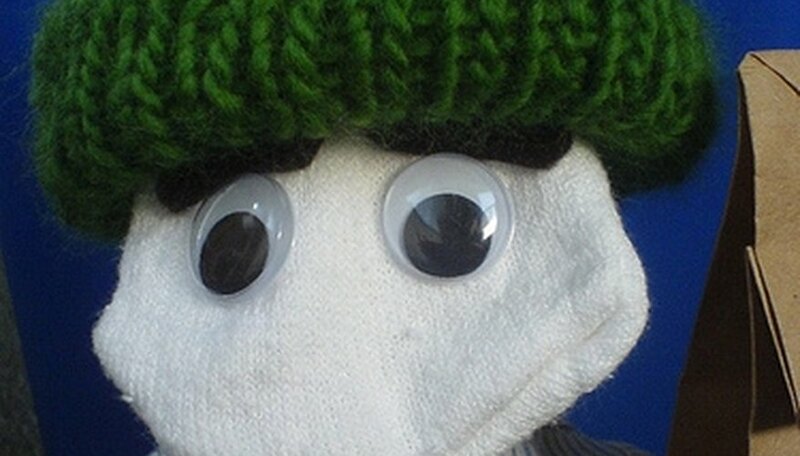 A old sock quickly turns into a puppet by gluing on googly eyes and a dyed cotton ball for hair or a nose. Adding a handkerchief or strip of felt creates a skirt or cape. An old knit glove becomes a spider by looping three pipe cleaners through the glove and tying them off to create a total of eight legs. Add googly eyes between two knuckles and yarn for bushy eyebrows. A brown paper bag is a common hand puppet that becomes an alien simply by gluing pipe-cleaner antennas to the top of the bag and construction paper teeth to the front of the fold. Attach table-tennis balls cut in half or googly eyes in front of the antennas and an alien is born. Take a plastic foam or hollow rubber ball and either draw a face or create one using craft supplies. Cut a hole in the bottom of the ball and attach a wooden dowel using glue, then connect the head to a small wooden box for the body. 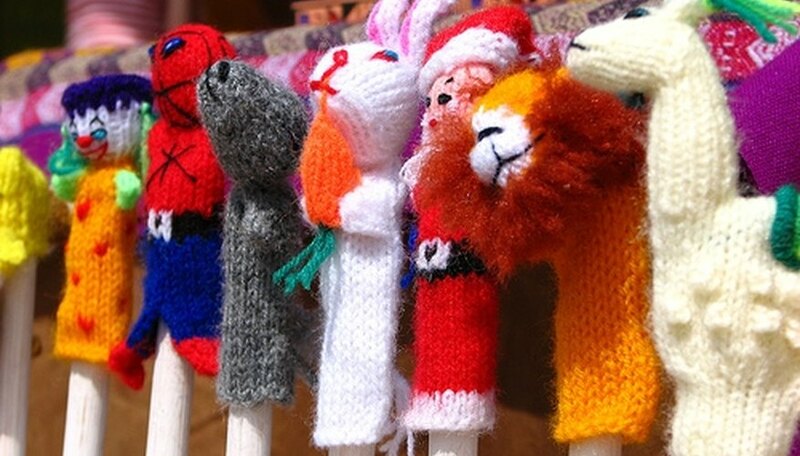 Decorate the body with arms, legs or clothing to create a static puppet that can be lifted by the rod above a puppet stage. Place a balloon over a finger and add facial features. Putting it on the finger first will ensure that the features are in the right place. Encourage children to tell a famous story through puppetry, but don't be afraid to combine puppet styles. For instance, if re-creating "Little Red Riding Hood," cover a sock in a red felt cape and hood to create the heroine, and use a brown paper bag to make the wolf. Glue a toilet paper tube on top, just above the fold, to make his long nose. Add googly eyes, construction paper teeth, and felt strips reinforced with pipe cleaners for his ears. Use the same Big Bad Wolf in the story of the "Three Little Pigs." Create the little pigs from three different colored balloons to give them personality and identity. By placing one balloon each on three different fingers, the little pigs can come together in the final scene very easily. Over the course of a 15-year career, John Briggs has written for print and online clients. As a syndicated TV critic, his work appeared in some of the country's top dailies. He has a degree in political science from Temple University and took additional writing classes at NYU.